Fundraiser for Abbey Webb by Heather Webb : Georgia Mae’s support fund. This morning, the team of doctors were able to provide an update. As of now, they’re telling us that Georgia has high-risk, or stage 4 neuroblastoma. The cancer has spread to her bone marrow and is likely in other areas of her body as well. We are preparing to conduct further tests within the next 2-3 days to determine exactly where all the cancer has spread. Her future looks like chemotherapy, radiation and surgery. Please continue to pray for Georgia’s healing and for her mommy and daddy’s strength through this very difficult journey. In the past month or two, Georgia began complaining of belly aches. Her complaints were not outrageous and did not seem alarming. It was something as simple as picking her up around her belly to wash her hands at the sink and she would complain that it hurt her belly to pick her up. As the days progressed, she complained more and more. The complaints still, honestly, didn’t trigger any major red flags because we thought it was a simple belly ache that would go away. On Friday, August 3rd 2018, Georgia had a debilitating belly ache. It was a rainy day and Georgia and Abbey spent the whole first half of the day laying around, watching movies together on the couch. Georgia would get up and go play for a short time and then return to the couch and tell Abbey that she "just didn't feel good today". A little later in the afternoon, Georgia started crying and complaining that her shoulder was hurting. She screamed and said her belly hurt and then told Abbey that she just needed to go lay down. Georgia walked to the edge of her bed and fell into the bed. She closed her eyes and basically became unresponsive. She was conscious, however, she would not respond to any questions or comments. The only sounds or reactions she gave were when me or Abbey tried to pick her up or sit her up to force her to talk to us. Georgia would scream tell us to just leave her in the bed and that we were making it worse by moving her. Georgia's face became very pale as did her lips and gums. Abbey called the on-call pediatrician, as it was now about 5:30pm or 6pm. The nurse took down the symptoms that Georgia was displaying and advised that she would have the pediatrician contact us. We got a phone call a short time later from the pediatrician stating that we needed to take Georgia to the children's emergency room at Wake Med hospital in Raleigh. We got to the ER and they began examining Georgia. Initially they said that nothing looked too alarming and that she possibly had a stomach bug. A second and third doctor entered the room and we got a totally different reaction. They said that they thought she looked very anemic and asked to run some blood tests. The results of the blood were scary. Her red blood count was around 4 (normal is around 11 or 12). The doctor said this red blood count was "severely low". We were transferred to UNC Chapel Hill and we were told that there were several other indicators on the blood results that were scary. We arrived at UNC Chapel Hill and began seeing specialists. More blood work, CT scans, ultrasounds and X-rays. The doctors told us that we would need to do a bone marrow biopsy. We were told that the possible cause of the scary blood results were a viral infection or, the scarier version, Leukemia. The ultrasound was completed and we got the results. 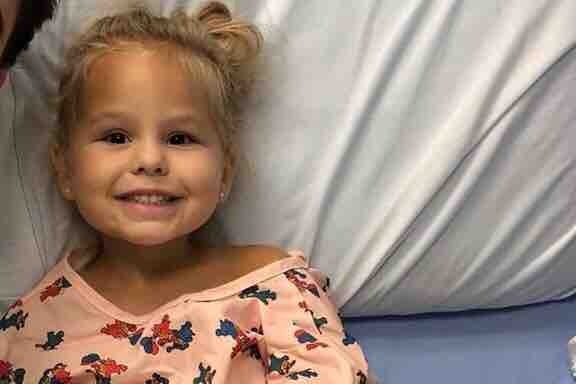 The doctors found one large tumor in Georgia's abdomen and likely, but not confirmed, other smaller tumors. The doctors explained that Leukemia was probably no longer a concern and that our new, and worse, concern was probably Neuroblastoma. This is a type of cancer that targets adrenal glands and presents itself in abdominal tumors. All of this cancer talk is ONLY what they believe this is, not what is confirmed. We have not received an official diagnosis but the doctors say they would be very surprised if this was anything else. They described the tumors as aggressive. We are waiting for more tests to confirm their suspicions but the reality is that Georgia Mae Webb possibly has cancer. Today's event is a biopsy of the tumor itself. This procedure will provide more details on the severity of the tumors, genetics of the tumor, etc. There are a lot of unanswered questions that we have. We understand that there are a multitude of people who may be wondering how this happened or how we got here. I wanted to write this morning to share with you a little bit of our story, most importantly so that you know how to better pray. If cancer is confirmed and that is the diagnosis that we receive, we are confident that this is not our end. Georgia is the strongest little girl I've ever seen and she is a fighter! We believe in miracles.